Becket — In her notes to “Tireless: A Tap Dance Experience,” program curator Michelle Dorrance, MacArthur awardee and tap dance legend, notes that from a young age, she knew that her legacy from her Dad was never to give up and never to get tired. There’s a chicken and egg issue here, but that’s perfect advice for a future tap dancer, who only through tireless practice can hone the body and ear to the point of letting go into transformative and transcendent movement and improvisation. For that’s the magic of tap: it is movement, plus percussive instrument, plus compositional originality through improvisation. And in colleagueship with its jazz roots, all this rests on a foundation of musical structure, communication, and a story to tell, often of the difficult lives of its African American and Latin originators. 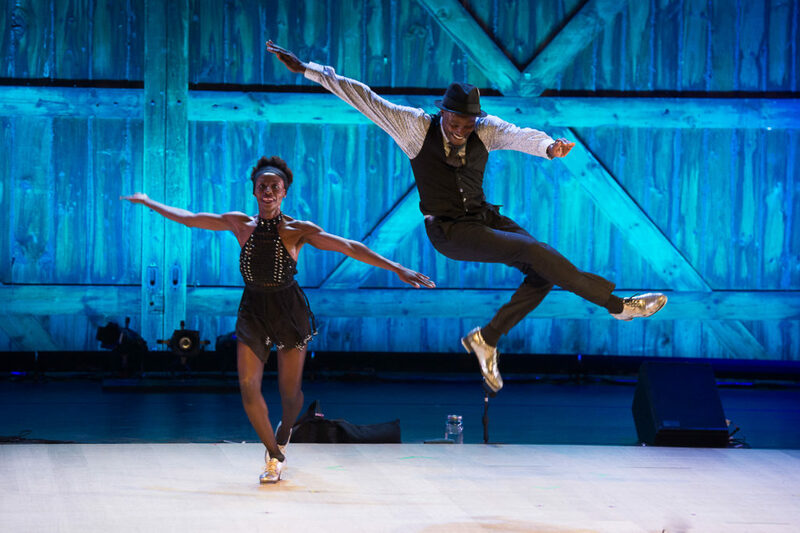 And what a story “Tireless: A Tap Dance Experience” is telling at Jacob’s Pillow this week, in both music and dance. The performance begins with an evocation of “Harmony, Tap in Motion” performed by siblings Joseph Wiggan and Josette Wiggan-Freund, themselves a picture of harmony of body and movement, with their lean lines, exquisite grace and wide smiles. Danced to Duke Ellington, of course, the master of smooth and elegant. Joe Orrach in ‘In My Corner.’ Illustration by Carolyn Newberger. This introduction to tap at its most refined is followed by “In My Corner,” Joe Orrach’s moving narrative of growing up a Puerto Rican Boy in New York. In spoken word and song, accompanied by piano, bass and conga drums, Mr. Orrach assumes the voices of himself as a growing child, as well as everyone else in his narrative, Anna Deveare-Smith style. We follow him through events large and small: his father’s instructions in holding a bat, folding toilet paper, and shaving; the aromas of his Italian mother’s cooking; his parents’ dancing; his high school pranks and their discriminatory consequences; boxing training; the military; and finally into his life as a dancer, finding himself despite his father’s disgust and rejection. In contrast to “Tap Harmony,” this is “tap raw,” spoken, punched, intoned, raged, punctuated by the saving grace of rhythm along the way, from his feet, to the jump rope in the gym, to the staccato cadences of a boxer’s punching bag. Brilliant, utterly original, and affecting. After the intermission, Japanese double bassist Takashi Seo and his wife, dancer Reona Seo, engage in an improvised jazz duet of feet and fingers. Dancing on a resonant wood platform, Ms. Seo begins by challenging Mr. Seo with corrugated scrapings of shoe dragged slowly across board. The bass responds with its own low growls. Then in call and response, synchrony and counterpoint, they accelerate into a virtuosic exchange of rhythm and jazz riffs, often seeming on the edge of chaos, always at the edge of control. “A Love Supreme” is described in the program notes as “the greatest and most spiritual” of John Coltrane’s masterpieces. Coltrane is channeled in this performance by saxophonist Irvin Pierce, with bassist Takashi Seo, pianist Matthew Clark, and drummer Isaiah Spencer. Note the transposition of Coltrane’s title. To this reviewer, the transposed title is a reminder not only of what we owe to the past, but to our responsibility to carry it forward into the future, with both respect and reverence, but also with imagination and the courage of the new as it builds from the past. Such was my experience of this dazzling ensemble, working together and in solo, falling to the floor seemingly in exhaustion, sometimes alone, sometimes together, always to rise with new life, new takes on the old tunes, and sometimes old takes on the masters of the past, such as a tip of the hat to Jimmy Slyde in a herculean slide across the stage. Eli notes that the program begins and ends with echoes of the Puerto Rican diaspora. At the outset, the sound of valve trombonist/composer Juan Tizol of the Duke Ellington band was one of the most recognizable voices in Ellington’s “Echoes of Harlem,” along with the growling plunger work of trumpeter Bubber Miley and alto saxophonist , Johnny Hodges. Tizo’s horn, in well spaced, quiet, single notes projected a spooky, haunting quality with which the two dancers utilized evocatively. In a huge jam at the end, a juicy live presentation of Tizol’s most famous song, “Caravan,” propelled a jet stream of rhythmic variations, slides, leaps, and tap acrobatics, riffing off of, and carrying into the stratosphere, the dance of Ellington’s great swing era contemporaries, such as Bunny Briggs and the aforementioned Jimmy Slyde. This should come as no surprise when we remember that tap, as with its sister, Jazz, comes from oppressed origins. That brings a certain recognition of the power of collaboration, of collective voices, as well as the value of the many ways that we express our art and our humanity. This allows art and its practitioners not only to survive, but to transcend. Your review and drawings brought me right back to the exhilerating experience of watching that show. Thank you. I’ve only seen Joe Orrach on YouTube and seeing both of them dance and doing the speedbag and jumpe rope is amazing I give it 5 stars and is very unique .